Some people have writing goals. 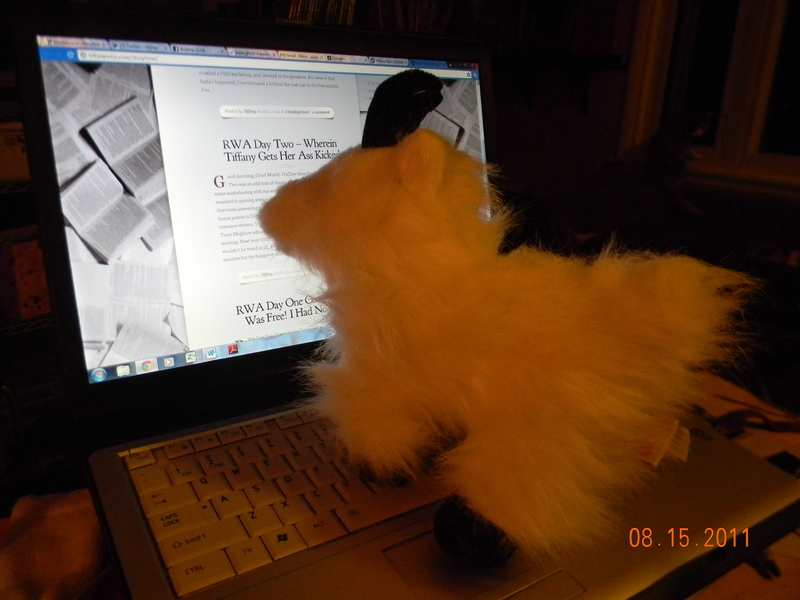 Others have writing goats, which are much cuter, and fuzzy. I currently have the luxury that my only writing deadlines are self-imposed. Of course, that leaves me with the danger that I might never actually get done. I’ve been sick today. My 13yo brought it home a couple weeks ago, then it knocked my husband flat, and now it’s my turn. So what if I did have contractual obligations to meet? Perhaps if I was deathly ill and hospitalized, a publisher or editor might understand. I do hear about authors saying “I missed a deadline…” or “I got an extension…” so I know such things do happen. Hopefully, someday I will have relationships with an agent, editor(s) and publisher(s.) And I know how life works… it’s too easy to let things slide until the last minute. Even when I was proofreading I found myself staying up late the night before a deadline and doing way too much of the work all at once. If I’d had any kind of a deadline this week, being sick would have meant not meeting that obligation. It’s easy to say now, but I know will be difficult in practice. I think I must plan, when the day comes that I do have contracts and deadlines, to aim to finish my work at least a few days if not weeks in advance. I have to make it a priority. Do you write when you’re sick, whether or not you have a deadline? This entry was posted in ROW80, Writing and tagged #ROW80, goals, goats, Tiffany Reisz, writing goals. Bookmark the permalink. Depends on how sick I was. If its a case that knocks me flat out, and I need sleep, then I don’t fight it and sleep. But if I can sit and concentrate for a few then I’ll do that. But then I’m a bit OCD about deadlines when i have them. I tend to get most of the work done, well before its due, and have polishing which I do up until the last minute. But I have spent plenty of times during my Open University degree, working through the night finishing off an essay. I can’t say that I do well under distress, either. I have a massive propensity for procrastination, no matter what the task or how easy it may be to complete. I have used sickness many times in the past as an excuse to miss deadlines, although not in the writing field. I hope you get back to feeling better soon, and can get right back on the writing horse again. I’m always uncomfortable using illness as an excuse. It’s too easy to fake, so I always feel like others are eyeing me with suspicion. It would get to be a problem if it was used multiple times… then, even if it was true, I couldn’t blame people for looking at me with suspicion. Illness is a tricky one. If it is illness that involves my head like a migraine I find it hard to write an a sickness bug I had recently meant I lept for four days solid. I didn’t read, watch tv, do anything! I guess if there was a deadline I had to meet I could have tried but actually I was kind of incapable of doing anything let alone anythng good!! I am with you, trying to stay on top of things and get things done early allows for life and illness to crop up without causing too much of a problem. It is an artist’s curse that sometimes I find the best stuff comes out when I’m either over-tired, or sick, or something. It’s just not a state I enjoy. Sleeplessness is especially difficult for me, as it just gets worse the longer I write. I try to write when I’m sick or in pain, because writing usually makes me feel better. It doesn’t always work, though. A few months ago my wisdom teeth–which I should have had out fifteen years ago–decided to get infected and give me the worst pain I have ever had in my life. I still managed to write by taking half-doses of Vicodin–just enough to numb the pain, but not enough to numb my brain. A few days after this started up, and a few days before my oral surgery to fix it, I got hit with a migraine on top of the toothache. Turns out that was the straw that broke the camel’s back and I took a day off. In fiction, the sick person would have several people around them saying “You’re sick! You should rest!” accompanied by offers to help take care of all the little things like housework while the sick person recuperates. I’ve even seed doctors in fiction portrayed as kindly, sympathetic souls who insist their patients get some much-needed rest. If only real life were this good. My hubby took time off from work to take me to the doctor, and he bought the medicine I needed, fixed dinner, and did some other stuff. But with him back at work, I find myself faced with a kitchen full of dirty dishes that I have to wash just to find a plate to eat off. The ice cube tray is empty, and there are fruit flies hovering over the table where last night’s dinner still sits. Part of me wants to whine about all the stuff that didn’t get done, but then I remind myself that there were quite a few other things he DID do.